Nov. 20 (Bloomberg) -- Palm oil output and exports from Indonesia, the biggest producer, may increase next year as the global economic recovery stokes demand for the world’s most consumed vegetable oil, according to industry officials. Shipments may grow between 7 percent and 10 percent from an estimated 15.8 million metric tons this year, Fadhil Hasan, executive director at the Indonesian Palm Oil Association, said in an interview. Output may climb to at least 21.5 million tons from this year’s 20.5 million, Hasan said. Increased shipments may help cool prices that have risen 40 percent this year on concern there may be a shortage of oilseeds, which can be crushed to produce a rival to palm oil. The advance has been aided by gains in crude, and signs the global economy is recovering from the worst recession since World War II. “Economic recovery in the U.S. and Europe, and strong growth in China and India” will support demand, Hasan said yesterday in Jakarta. Palm oil for February delivery slid 1.2 percent to 2,371 ringgit ($700) a ton yesterday on the Malaysia Derivatives Exchange as some investors sold the commodity to lock in gains after the contract climbed to a three-month high on Nov. 18. The price must stay at about current levels as any further increase will make palm oil less attractive than other edible oils, said Steaven Halim, second secretary at the association. “I don’t think it’s good if it goes higher, because usually if it gets too high, users will rationalize consumption,” he said. Hasan’s output forecast is less than the prediction from Dorab Mistry, director of Godrej International Ltd., one of India’s biggest buyers of vegetable oils. Mistry said in September that Indonesia may produce 21.5 million tons this year, and 23.5 million in 2010. Output in Malaysia, the second-largest producer, may total 17.5 million tons this year and expand by 500,000 tons next year, he said. Mistry has been trading edible oils for more than three decades. Indonesia shipped 11.4 million tons in the first nine months of the year, 16 percent more than a year ago, the association said Oct. 19. Inventories probably climbed to 1.7 million tons in October, compared with the August and September average of 1.3 million to 1.4 million tons, the nation’s palm oil board said Nov. 2. India imported 8.66 million tons of vegetable oils in the year ended Oct. 30, 2009, the highest level in 15 years, the Solvent Extractors’ Association said Nov. 16. Palm oil makes up 80 percent of the total. Palm oil purchases by China climbed 9 percent to 3.9 million tons between January and September, according to customs data. India and China are the biggest consumers of edible oils. Nov. 19 (Bloomberg) -- Soybean prices may gain 20 percent by March as economic growth in China, the world’s largest importer, boosts demand for animal feed and cooking oil, a U.S. exporter group said. The oilseed may surpass the nine-month high of $12.3650 a bushel reached June 5 in Chicago before new supplies from Brazil and Argentina, the largest exporters after the U.S., become available, said Danny Murphy, treasurer of the U.S. Soybean Export Council. Soybeans climbed to a three-month high yesterday and have gained 4.6 percent this year as imports by China are set to reach a record. The nation’s demand for the oilseed protein meal may expand 27 percent in the next decade as rising meat consumption boosts demand for stock feed, according to HighQuest Partners, a consulting company based in St. Louis, Missouri. There will be a “substantial increase” in Chinese demand this marketing year, Murphy said yesterday in an interview in Tokyo. China’s potential market for soybeans “could be three- times or four-times of what it is today as the economy continues to grow,” he said. Chinese soybean use for crushing will grow 7.6 percent from a year earlier to 44.1 million metric tons in the 2009/10 year, the U.S. Department of Agriculture forecast on Nov. 10. About 5 million tons of U.S. soybeans have been delivered to China since Sept. 1, and an additional 10 million tons are booked for delivery, council Chief Executive Officer Miguel Escobar said in the same interview. The U.S. sold 19 million tons in China in the year ended Aug. 31, he added. U.S. soybean exports may grow 4 percent to about 40 million tons in the year ending Aug. 31, 2010, as a weaker dollar makes the product more competitive to buyers overseas, Murphy said. The dollar this week dropped to the lowest level since August 2008 against a basket of six major currencies. Soybeans for January delivery gained 0.3 percent to $10.305 a bushel as of 12:27 p.m. in Tokyo. Prices climbed to a record $16.3675 a bushel on July 3, 2008, amid a rally in global food prices. Soybeans fell to a six-month low of $8.7875 on Oct. 5 amid forecasts of a record U.S. harvest. U.S. farmers will harvest 3.319 billion bushels this year, up 12 percent from last year, and almost double stockpiles before the 2010 harvest, the Department of Agriculture said Nov. 10. The U.S. is the world’s top producer and exporter. Global output will climb 19 percent from a year earlier to 250.2 million tons, raising reserves to 25 percent of projected consumption, the USDA said. Chinese soybean imports may exceed 3.5 million tons in November on lower costs, the China National Grain & Oils Information Center said Nov. 17. Chinese imports fell for a fourth month in October to 2.52 million metric tons after reaching a record 4.71 million tons in June. The country’s economy grew 8.9 percent in the third quarter from a year earlier, the fastest pace in a year, as stimulus spending and record lending growth helped the nation lead the world out of recession. The median projection of economists surveyed by Bloomberg News is for GDP to jump more than 10 percent in the final three months of 2009. Nov. 19 (Bloomberg) -- Gold futures rose, erasing an earlier loss, on speculation that the dollar will fall, boosting demand for the precious metal as an alternative investment. The dollar climbed as much as 0.8 percent against the euro before paring gains. Yesterday, gold rose to a record $1,153.40 an ounce in New York. Gold futures for December delivery rose 70 cents to $1,141.90 an ounce on the New York Mercantile Exchange’s Comex division. Earlier, the price dropped as much as 1 percent. In London, bullion for immediate delivery slipped 80 cents to $1,144.70 an ounce at 7:35 p.m. local time. Gold has gained in 14 of the past 16 sessions in New York and is up 29 percent this year. The dollar has fallen 6.3 percent against the euro. The dollar’s rebound today probably is temporary, analysts said. The Federal Reserve has kept its benchmark lending rate at zero percent to 0.25 percent for almost a year, to help revive the economy. That has driven the U.S. currency lower as investors switch to higher-yielding assets. “The dollar is going to be a victim of the carry trade until the Fed starts tightening,” Zeman said. Gold demand climbed 10 percent in the third quarter to 800.3 metric tons from the previous three months, partly on demand for a currency hedge, the World Gold Council said today. Jewelry purchases also rose, the group said. The U.K.’s Royal Mint said its third-quarter output of gold coins quadrupled compared with a year earlier. Holdings in the SPDR Gold Trust, the biggest exchange- traded fund backed by bullion, rose 3.66 tons to 1,117.49 tons yesterday, the first gain since Nov. 9. Investments in gold ETFs surged 68 percent in the first nine months of 2009, the gold council said yesterday. India, Sri Lanka and Mauritius have been buying gold to diversify reserves. Gold’s surge to a record yesterday held the metal’s 14-day relative-strength index above 70, a signal that prices may fall. Among other precious metals traded in New York, silver futures for December delivery rose 4 cents, or 0.2 percent, to $18.455 an ounce. January platinum dropped $8.10, or 0.6 percent, to $1,443.90 an ounce. December palladium slid $4.25, or 1.1 percent, to $369.90 an ounce. Nov. 20 (Bloomberg) -- Crude oil traded below $78 a barrel in New York after falling yesterday as the dollar strengthened and amid concerns about the pace of recovery in the U.S., the world’s biggest energy consumer. Oil dropped for the first time in four days as U.S. stocks extended a global drop amid concern that the rally has outpaced the prospects for economic growth. Prices also declined as the dollar advanced against the euro, reducing the appeal of commodities as an alternative investment. Crude oil for December delivery traded at $77.78 a barrel, up 32 cents in electronic trading on the New York Mercantile Exchange at 10:34 a.m. Sydney time. Yesterday, the contract fell $2.12, or 2.7 percent, to $77.46, the biggest decline since Nov. 12. Futures have climbed 74 percent this year and are poised for a gain of 1.9 percent for the week. The Standard & Poor’s 500 Index fell 1.3 percent to 1,094.90 in New York yesterday. The Dow Jones Industrial Average lost 0.9 percent to 10,332.44. The dollar traded at $1.4914 against the euro at 10:39 a.m. Sydney time, from $1.4925 yesterday. Nigerian Oil Minister Rilwanu Lukman said he doubted the Organization of Petroleum Exporting Countries would cut supply with prices at current levels. OPEC members generally prefer to have higher quotas, he told reporters in London yesterday. OPEC plans to meet in Angola in December to discuss production. OPEC shipments are expected to remain steady in the four weeks ending Dec. 5, according to tanker tracker Oil Movements. Members will ship 22.78 million barrels a day in that period, in line with an average of 22.73 million barrels in the month to Nov. 7, Halifax, England-based Oil Movements said yesterday. Brent crude for January settlement declined $1.83, or 2.3 percent, to end the session at $77.64 a barrel on the London- based ICE Futures Europe exchange yesterday. Nov. 20 (Bloomberg) -- The yen and the dollar may gain against the euro for a second day as Asian stocks extended the biggest drop in global equities this month, boosting demand for the two currencies as a refuge. The dollar headed for a weekly gain against 12 of its 16 major counterparts amid speculation traders cut bets the currency will weaken and U.S.-based investors will bring home funds before the holiday season. The Australian and New Zealand dollars headed for their first weekly loss against the U.S. currency this month on prospects a sluggish global recovery will deter policy makers from raising interest rates. The yen traded at 132.82 per euro as of 9:33 a.m. in Tokyo from 132.79 in New York yesterday, when it climbed to 131.76, the strongest level since Nov. 3. It has gained 0.6 percent against the euro this week. The dollar was at $1.4925 per euro from $1.4925. On the week, it has dropped 0.2 percent. Japan’s currency was at 89.00 per dollar from 88.97, heading for a 0.7 percent weekly gain. Australia’s dollar was at 91.88 U.S. cents from 91.86 cents, heading for a 1.4 percent weekly drop. It slid 1.2 percent yesterday as the drop in stocks discouraged carry trades, in which investors buy higher-yielding assets with funds borrowed in nations with relatively low interest rates. Borrowing costs near zero in the U.S. and 0.1 percent in Japan make their currencies popular for investors funding such transactions. The New Zealand dollar was at 73.07 U.S. cents from 73.11. It has dropped 1.7 percent this week. The Nikkei 225 Stock Average fell 0.8 percent, heading for a fourth consecutive weekly loss, the longest losing streak since October 2008. The MSCI Asia Pacific Index of regional shares dropped 0.4 percent. The MSCI World Index decreased 1.7 percent yesterday, the biggest decline since Oct. 30. The Dollar Index, which InterContinental Exchange Inc. uses to track the greenback against the currencies of six major U.S. trading partners including the euro, advanced 0.1 percent to 75.271 yesterday. 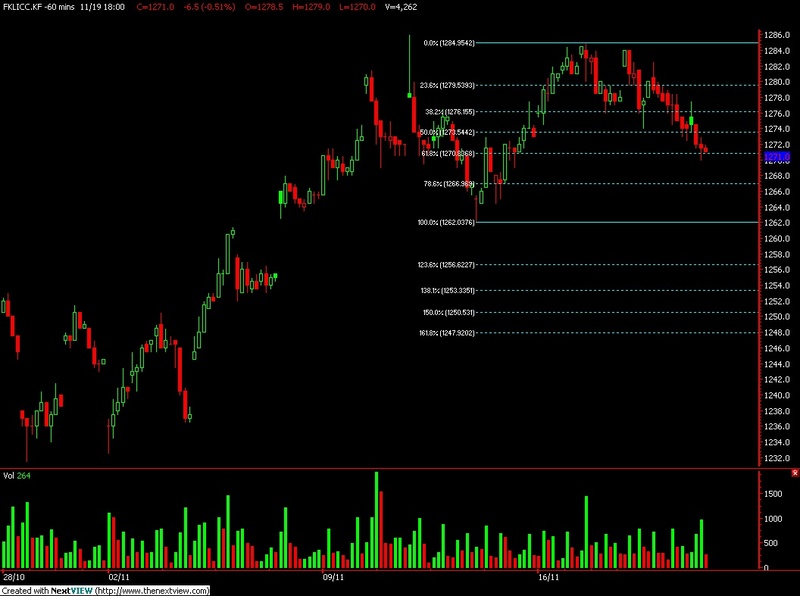 Technically, FKLI further test 61.8% Fibonacci support levels at 1270.5 regions after fail to penetrate resistance levels at 1278 regions. Based on our technical view, FKLI was seen would trade higher in the coming trading sessions provided support levels at 1270 and 1262 were not violated during trading sessions. Our opinion suggests FKLI would likely found bottomed around 1270 or 1266 regions; 161.8% and 178.6% Fibonacci support levels. 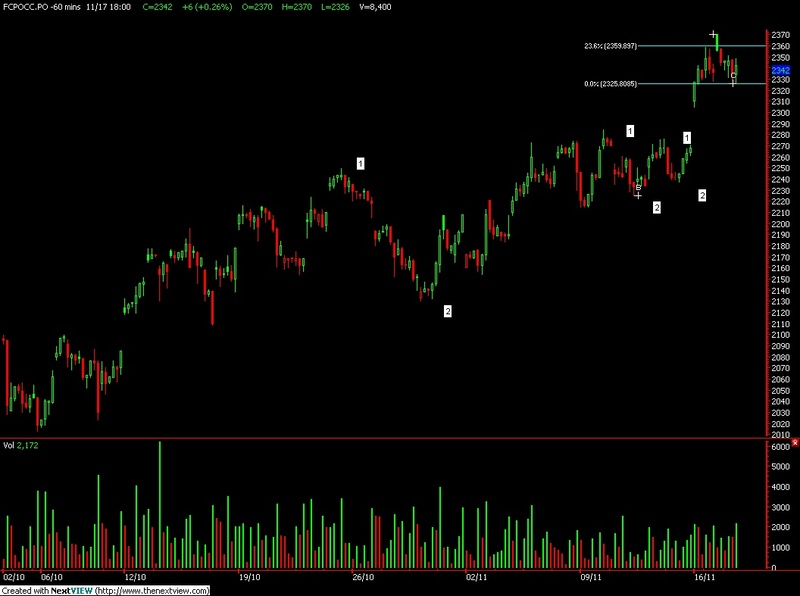 Traders were advice to hold long position while be cautious around resistance levels at 1278 and 1285 regions. CPO 3rd month Feb futures contract fall RM29 points lower as compare to previous trading sessions to close at RM2371 with a total of 11,840 lots traded in the market. 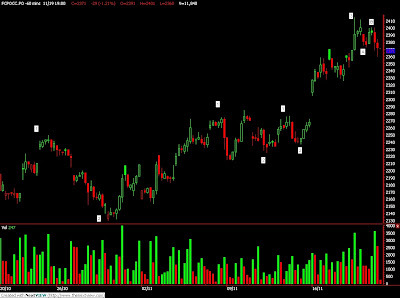 CPO price was traded lower due to heavy profit taking activity after huge swing on previous trading days. Lack of follow through buying interest from soybean oil and crude oil during electronic trading session further encourages profit taking due to weak fundamental support. Technically, CPO price fail to penetrate 61.8% Fibonacci resistance levels at RM2400 regions after 3 attempts in the hourly chart. Based on our technical view, CPO price seems complete wave B count and wave 4 was expected to encounter great support around RM2342 and RM2297; 38.1% and 61.8% Fibonacci support levels. Our opinion suggests CPO price would likely to trade upwards soon after support level is found in the coming trading session. Traders were advice to apply long on dip strategy in the coming trading session while be cautious around resistance levels at RM2385 and RM2406 regions. Nov. 18 (Bloomberg) -- Crude oil rose after the government reported that U.S. crude and fuel supplies dropped along with refinery production and imports. Oil inventories fell 887,000 barrels to 336.8 million last week, the Energy Department said. Stockpiles were forecast to increase by 300,000 barrels, according a Bloomberg News survey of analysts. Fuel inventories decreased as refiners operated at the slowest pace in more than a year. “There were draws in crude oil, gasoline and distillates, so the initial numbers looked very bullish,” said Rick Mueller, a director of oil markets at Energy Security Analysis Inc. in Wakefield, Massachusetts. Crude oil for December delivery rose 44 cents, or 0.6 percent, to $79.58 a barrel on the New York Mercantile Exchange, the highest settlement since Nov. 5. Futures have traded between $74.79 and $82 since Oct. 15. Oil is up 78 percent this year. Crude oil stockpiles declined 4.37 million barrels to 333.1 million last week, the American Petroleum Institute said in a report yesterday. Imports of crude oil declined 0.9 percent to 8.58 million barrels a day, the report showed. Along the Gulf of Mexico coast imports tumbled 16 percent to 4.28 million as Hurricane Ida disrupted the arrival of shipments. Gasoline inventories declined 1.76 million barrels to 209.1 million in the week ended Nov. 13. The 18 analysts surveyed by Bloomberg News were split over whether stockpiles of the motor fuel had increased or fallen. Gasoline for December delivery climbed 0.65 cent, or 0.3 percent, to end the session at $2.0114 a gallon in New York. It was the highest settlement since Nov. 4. Refineries operated at 79.4 percent of capacity, down 0.5 percentage point from the prior week, leaving units functioning at the slowest pace since September 2008 when hurricanes Gustav and Ike stuck the Gulf. The average rate during the second week of November over the previous five years was 87.9 percent of capacity. Supplies of distillate fuel dropped 328,000 barrels to 167.4 million last week, the report showed. An 850,000-barrel decline was forecast, according to the median of responses in the Bloomberg News survey. Total U.S. daily fuel demand averaged 18.6 million barrels in the past four weeks, down 4.1 percent from a year earlier, the report showed. Consumption of distillate fuel averaged 3.59 million barrels, down 11 percent. Prices also advanced as the dollar weakened against the euro, bolstering the appeal of commodities as an alternative investment. The greenback slipped 0.5 percent to $1.4949 against the common currency, from $1.4876 yesterday. BNP Paribas SA raised its fourth-quarter price forecast for West Texas Intermediate oil, the U.S. benchmark, to $77 a barrel, from $66 previously, senior oil analyst Harry Tchilinguirian said in a research note today. “Ongoing” U.S. dollar weakness and low interest rates are among the reasons for the change, according to London-based Tchilinguirian. WTI crude will average $81 a barrel next year, BNP said, up from its previous forecast of $78. Brent crude oil for January settlement rose 50 cents, or 0.6 percent, to end the session at $79.47 a barrel on the London-based ICE Futures Europe exchange. Oil volume in electronic trading on the Nymex was 511,813 contracts as of 2:58 p.m. in New York. Volume totaled 577,946 contracts yesterday, 3.2 percent higher than the average over the past three months. Open interest was 1.2 million contracts. The exchange has a one-business-day delay in reporting open interest and full volume data. Nov. 18 (Bloomberg) -- Gold climbed to a record in New York as investors bought precious metals as an alternative to holding weaker dollars. Silver, platinum and palladium reached the highest prices in at least 14 months. Gold futures jumped to $1,153.40 an ounce, the highest ever, as the dollar declined as much as 0.8 percent against the euro. Before today, the U.S. Dollar Index, a six-currency gauge of the greenback’s value, slid 7.3 percent this year as bullion climbed 29 percent in New York. Gold futures for December delivery rose $1.80, or 0.2 percent, to $1,141.20 an ounce on the New York Mercantile Exchange’s Comex unit, advancing for a fourth straight session. In London, bullion for immediate delivery reached a record $1,152.85 an ounce. The metal traded at $1,142.40 at 7:01 p.m.
Investment in the SPDR Gold Trust, the biggest exchange- traded fund backed by bullion, has risen 43 percent this year to 1,113.83 metric tons. The fund holds more gold than the government of China. Demand for gold from governments, pension funds and investors has helped prices rally for a ninth straight year. Monetary-policy makers have set borrowing costs near zero and spent $2 trillion to pull the world out of the recession. Hedge-fund operator Paulson & Co. plans to start a gold fund in January, the Wall Street Journal reported today. Founder John Paulson may invest $250 million of his own capital in the fund, the newspaper said. “The free flow of money in terms of low interest rates keeps up the appetite for gold,” Archer’s Platt said. The U.S. central bank has kept its benchmark interest rate at between zero percent and 0.25 percent for almost a year. James Bullard, the Federal Reserve Bank of St. Louis president, said today that policy makers may not start to raise rates until early 2012. The European Central Bank’s main rate is at 1 percent while the Bank of England’s rate is at 0.5 percent. The International Monetary Fund said this week that it sold 2 tons of bullion, valued at about $71.7 million, to Mauritius. The sale followed India’s $6.7 billion purchase of 200 tons in October. The IMF plans to bolster its finances by selling 403.3 tons of the metal from its reserves. The Washington-based lender is the third-largest holder of gold after the U.S. and Germany. China ranks sixth among official holders with 1,054 tons, according to data from the producer-funded World Gold Council. Governments, the biggest holders of gold, have been sellers in the past decade. The Central Bank Gold Agreement binds some governments to annual sales caps of 400 tons until 2014. “The gold bull run is not predicated upon inflation but is instead predicated upon the notion that gold is becoming a reservable asset,” said Dennis Gartman, an economist in Suffolk, Virginia, where he publishes the Gartman Letter. Gold priced in euros and sterling also reached records earlier this year. Some investors use gold to hedge against inflation. The consumer-price index rose 0.3 percent in October from the previous month, following a 0.2 percent increase in September, figures from the U.S. Labor Department showed today. Gains were limited after some investors sold the metal as the four-session rally pushed spot gold’s 14-day relative- strength index above 70. Some analysts, who use the gauge to forecast price changes, say a level above 70 may signal a drop. The measure has topped 70 since Nov. 12. Among other precious metals, silver futures for December delivery rose 2.8 cents, or 0.2 percent, to $18.415 an ounce in New York after reaching $18.855, the highest since July 2008. January platinum fell $10.50, or 0.7 percent, to $1,452 an ounce after touching $1,471.70, the highest since Sept. 2, 2008. December palladium rose $2.15, or 0.6 percent, to $374.15 an ounce. It reached $380 earlier, the highest since August 2008. Nov. 19 (Bloomberg) -- The dollar traded near a three-week low against the euro on speculation a Federal Reserve official today will reiterate the central bank’s pledge to keep interest rates near zero to support growth. The U.S. currency may weaken before a government report today forecast to show manufacturing in the Philadelphia region expanded for a fourth month, boosting demand for higher-yielding assets. The euro was poised to gain against the yen on prospects a European Central Bank official tomorrow will signal the central bank is moving closer to ending its stimulus measures. The dollar traded at $1.4953 per euro as of 9:11 a.m. in Tokyo from $1.4963 yesterday. It fell to $1.5048 on Nov. 11, the weakest level since Oct. 26. The yen was at 89.36 per dollar from 89.32. The euro fetched 133.59 yen from 133.64 yen. Fed Bank of St. Louis President James Bullard said yesterday in St. Louis that past experience indicates policy makers may not start to raise interest rates until early 2012. Bullard will be a voting member of the Federal Open Market Committee next year. Dallas Fed President Richard Fisher will speak at the Cato Institute’s 27th Annual Monetary Conference, “Restoring Global Financial Stability” in Washington today. The Federal Reserve Bank of Philadelphia will report today that its economic index rose to 12.2 this month from 11.5 in October, according to the median estimate of economists in a Bloomberg News survey. A positive reading signals expansion. Weber earlier said that missing the right time to exit from fiscal and monetary stimulus measures increases the risk of further turmoil. FKLI Nov Futures contract closed marginally 0.5 points lower to close at 1277.5 levels as compare to previous trading session to with a total of 4,001 lots traded in the market. FKLI was traded wide range as regional indices were traded without affirmative direction during trading sessions despite Dow Jones was closed firm during overnight trading sessions. 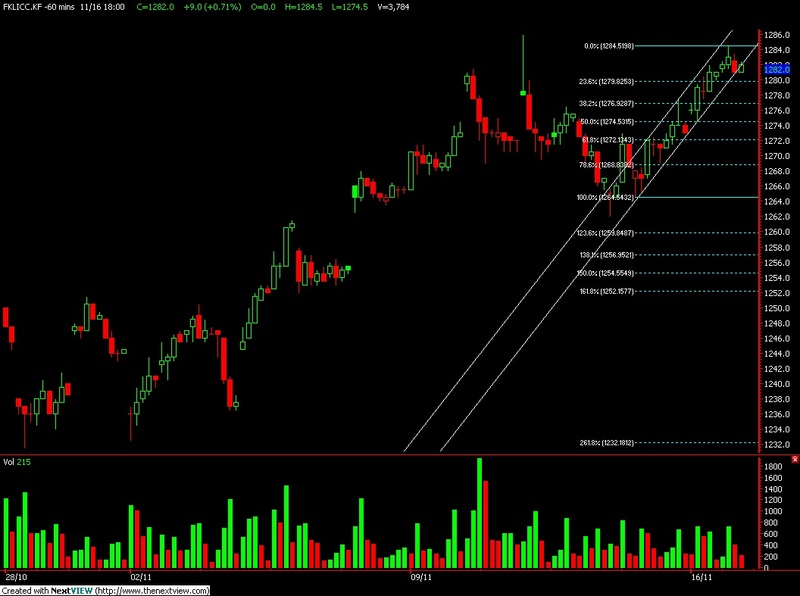 Technically, FKLI price fail to penetrate 1284.5 resistance levels after 3rd attempt to penetrate the resistance levels. 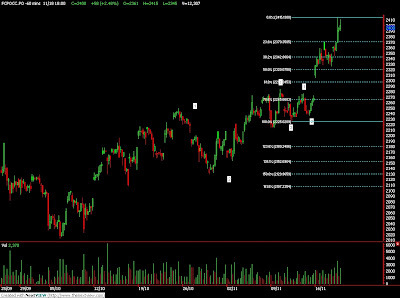 Based on our technical view, FKLI manage to rest on 50% and 100% Fibonacci support levels at 1274 regions. Our opinion suggests FKLI would likely to trade higher provided well supported above support levels at 1272 and 1268 regions. Traders were advice to hold long position around support levels while be cautious around resistance levels at 1285 and 1295 regions. CPO 3rd month Feb futures contract rose RM58 points higher as compare to previous trading sessions to close at RM2400 with a total of 12,307 lots traded in the market. CPO price was traded higher during trading sessions as soybean oil and crude oil were traded strong during overnight and electronic trading during trading sessions. 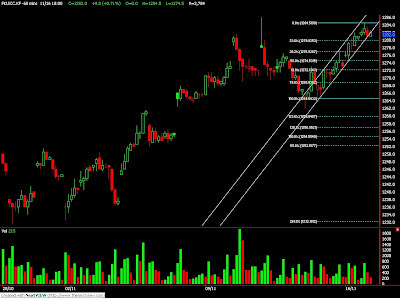 Technically, CPO price continue surge higher after consolidate around support levels at RM2330. 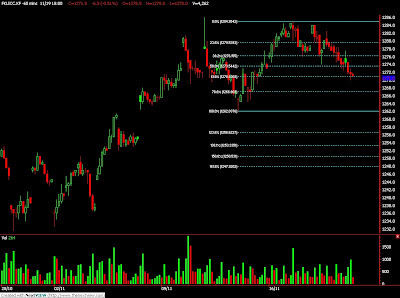 Based on our technical view, CPO price seems complete 61.8% and 261.8% Fibonacci resistance levels at RM2415 levels. 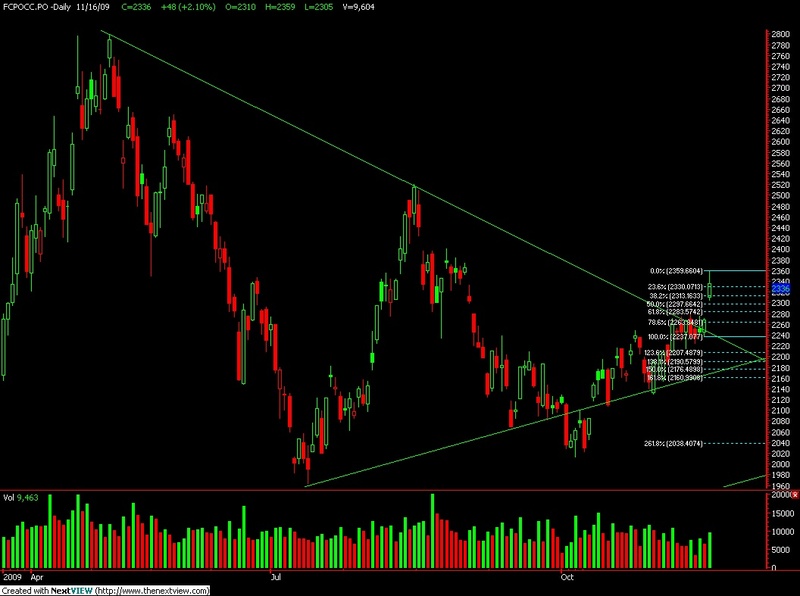 Based on our opinion, CPO price seems likely to trade lower towards RM2342 and 2300 support levels. Traders were advice to apply long on dip strategy in the coming trading session while be cautious around resistance levels at RM2415 and RM2450 regions. Nov. 18 (Bloomberg) -- The most active palm oil contract on the Dalian Commodity Exchange climbed as much as 1.3 percent to 6,492 yuan a metric ton, the highest level since Aug. 31. Palm oil for delivery in May traded at 6,490 yuan at 10:38 a.m. local time. Nov. 17 (Bloomberg) -- The Organization of Petroleum Exporting Countries will leave its crude production target “as is” at a December meeting and will ask members for better adherence to quotas, Kuwait’s oil minister said. “We will ask for more compliance, that’s all,” Sheikh Ahmed Al-Abdullah Al-Sabah said in Kuwait City today. The group’s average compliance with its goal of cutting output should be more than 65 percent, he said. Oil has climbed by 77 percent this year, trading above $80 last week, on speculation the pace of the global economic recovery is accelerating. The rebound in prices, which had dropped as low as $32.40 a barrel in December, came after OPEC members agreed to cut production late last year. Crude prices between $75 and $80 a barrel are “good” and “comfortable,” he said. The prices next year will depend on whether an improvement in the economy continues, he said. “There is ample supply in terms of gasoline, in terms of crude oil,” Al-Sabah said. Oil demand is rising, he said. OPEC president, the Angolan Oil Minister Jose Maria Botelho de Vasconcelos, yesterday said average compliance at 65 percent was “good.” Compliance slipped to about 60 percent in October, from 62 percent in September, according to OPEC’s own monthly report, published Nov. 11. “Now its 60 percent, we want to see it more than 65” Al- Sabah said. OPEC’s 12 members are Algeria, Angola, Ecuador, Iran, Iraq, Kuwait, Libya, Nigeria, Qatar, Saudi Arabia, the United Arab Emirates and Venezuela. The 11 members bound by supply quotas pumped 26.523 million barrels a day last month, compared with a formal limit of 24.845 million a day, according to OPEC’s latest monthly report, which uses data from secondary sources including analysts and news agencies. Iraq is exempt from quotas. OPEC members are scheduled to meet on Dec. 22 in Luanda, Angola, to review production quotas that the group left unchanged at three gatherings in 2009. OPEC last agreed to increase supply targets in September 2007. Nov. 18 (Bloomberg) -- Oil advanced for a third day in New York after an industry report showed a decline in crude stockpiles in the U.S., the largest energy consumer. The American Petroleum Institute said yesterday crude inventories fell by 4.37 million barrels last week to 333.1 million. The Energy Department will release its weekly supply report today in Washington. Crude oil for December delivery gained 44 cents, or 0.6 percent, to $79.58 a barrel in electronic trading on the New York Mercantile Exchange at 11:31 a.m. in Sydney. Yesterday, the contract rose 24 cents to settle at $79.14. Prices have gained 78 percent since the start of the year. Energy producers in the U.S. idled about 43 percent of oil output in the Gulf of Mexico on Nov. 10 after Tropical Storm Ida made landfall, according to the Interior Department’s Minerals Management Service. The Organization of Petroleum Exporting Countries will leave its oil production target “as is” at a December meeting and will ask members for better adherence to quotas, Kuwait’s oil minister, Sheikh Ahmed al-Abdullah al-Sabah, said yesterday. OPEC will meet on Dec. 22 in Luanda, Angola, to discuss output targets, after agreeing to leave them unchanged at the past three meetings. The Energy Department report will probably show stockpiles of crude oil climbed 300,000 barrels, according to the 17 analysts who provided crude estimates. Ten respondents forecast a gain, and seven said there would be a decline. Those looking for an inventory drop focused on disruptions caused by Hurricane Ida. “We are seeing strong demand growth out of the emerging economies,” Hassall said. China last week reported October net oil imports of 18.98 million tons, the second-highest volume on record. Oil declined as much as 1 percent yesterday as the dollar rose against the euro. The U.S. currency traded at $1.4879 per euro at 11:31 a.m. in Sydney, from $1.4876 yesterday. Brent crude oil for January settlement rose 21 cents, or 0.3 percent, to $78.97 a barrel on the London-based ICE Futures Europe exchange yesterday. Nov. 18 (Bloomberg) -- The dollar traded near a two-week high against the euro after U.S. industrial production rose in October less than economists forecast, reviving concern the economic recovery will be sluggish. The U.S. currency rallied yesterday after European Central Bank President Jean-Claude Trichet said a strong dollar is in the world’s best interest. The pound traded near a two-month high versus the euro after a Bank of England policy maker said this week that Britain risks stoking inflation if it keeps stimulus in place for too long. The dollar traded at $1.4886 versus the euro as of 9:26 a.m. in Tokyo from $1.4876 in New York yesterday, when it touched $1.4808, the strongest since Nov. 4. The U.S. currency was at 89.27 yen from 89.25 yen. The euro bought 132.90 yen from 132.77 yen. The greenback gained yesterday after a Federal Reserve report showed U.S. industrial production increased 0.1 percent last month after a 0.6 percent advance in September. Economists in a Bloomberg survey called for a 0.4 percent gain. The Dollar Index, which IntercontinentalExchange Inc. uses to track the U.S. currency’s value against the euro, yen, pound, Canadian dollar, Swiss franc and Swedish krona, increased 0.6 percent to 75.327 yesterday. Gains in the dollar may be curbed before government reports today forecast to show U.S. housing starts rose and building permits gained last month. The Commerce Department will say U.S. housing starts rose to an annual rate of 600,000 in October from a 590,000 pace in September, according to the median estimate of economists in a Bloomberg News survey. The report is due today in Washington. Permits, a sign of future construction, probably advanced to an annual rate of 580,000 last month from 573,000 in September, according to a separate survey. In carry trades, investors get funds in a country with relatively low borrowing costs and invest in another nation with higher interest rates. Benchmark interest rates are as low as zero in the U.S., 1 percent in the 16-nation region that uses the euro, and 3.5 percent in Australia. The pound traded at 88.47 pence per euro from 88.49. It touched 88.34 yesterday, the strongest since Sept. 15. 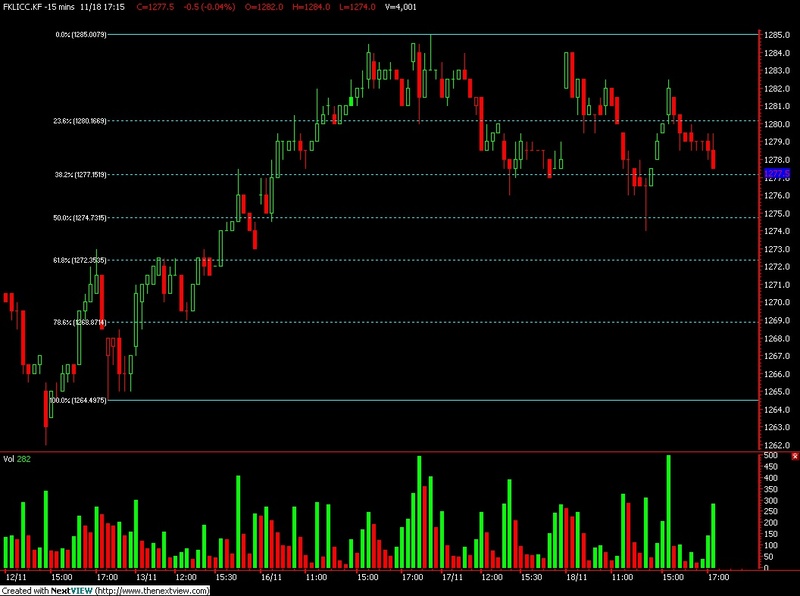 FKLI Nov Futures contract traded 4 points lower to close at 1278 levels as compare to previous trading session to with a total of 4,830 lots traded in the market. FKLI was traded lower despite Dow Jones Industrial Average were trade strong during overnight trading as regional indices were traded weak during trading sessions. 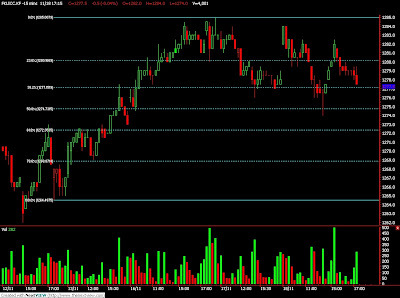 Technically, FKLI price fail to penetrate 178.6% Fibonacci resistance levels at 1284.5 regions and traded lower after break down lower from the uptrend chancel support line. 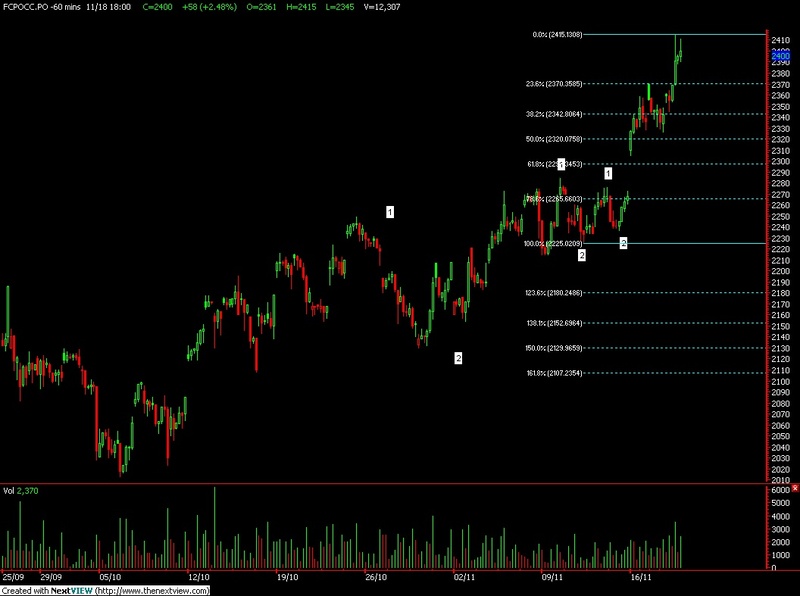 Based on our technical view, FKLI seems finish correction count at 38.1% Fibonacci support levels at 1276.5. Our opinion suggests FKLI would start trade higher in the coming trading sessions provided support levels at 1276 and 1272 were not violated. 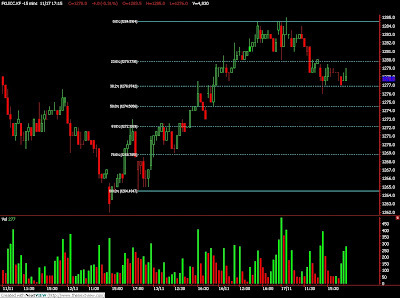 Traders were advice to hold long position while be cautious around resistance levels at 1284.5 and 1300 regions. CPO 3rd month Feb futures contract traded marginally RM6 points higher as compare to previous trading sessions to close at RM2342 with a total of 8,400 lots traded in the market. CPO price was open higher but traded lower towards sideways during some profit taking activities due to heavy buy up during last trading sessions as soybean oil and crude oil were closed firm during overnight trading. Technically, CPO price formed irregular correction pattern and seems temporary rest on 23.6% Fibonacci support levels at RM2330 regions. Based on our technical view, CPO price would likely to trade higher in the coming trading session after several attempts to breach support levels at RM2330 failed. Our opinion suggests CPO price would trade higher provided support levels at RM2330 and RM2300 were not violated during trading sessions. 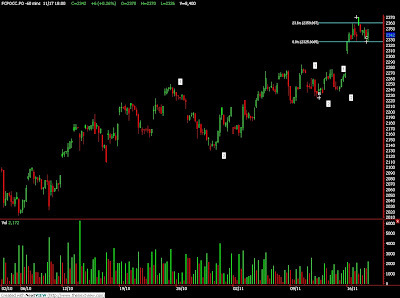 Traders were advice to hold long position while be cautious around resistance levels at RM2381 and RM2415 regions. Nov. 17 (Bloomberg) -- Palm oil fell as some investors judged the rally to an 11-week high, spurred by advances in soybeans, was excessive. February-delivery palm oil climbed as much as 1.5 percent to 2,370 ringgit ($705) a metric ton, the highest level for the most-active contract since Aug. 28. It lost 0.2 percent to 2,331 ringgit at 5:20 p.m. on the Malaysia Derivatives Exchange. 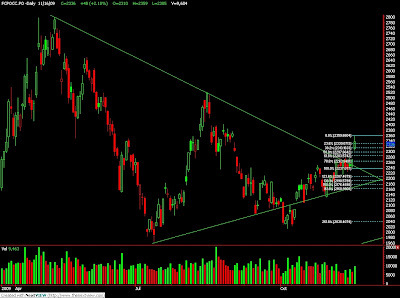 The tropical commodity could trade between 2,100 and 2,200 ringgit in the next four to six weeks as “there’s potential for a pullback and that’s a realistic trading range,” Briggs said. JPMorgan Chase & Co. said in a report that dry weather in Southeast Asia may curb production in the first half, which may help palm oil. Palm oil output is typically lower in the first half than in the second. Soybean oil for January delivery surged 2.9 percent to 40.18 cents a pound yesterday in Chicago, posting the highest close since June 4. That left soybean oil $195.14 a ton more expensive compared with palm oil, the widest premium since Oct. 21, according to Bloomberg calculations. “There’s some value in the palm oil-bean oil spread” currently, Tobin Gorey, a commodity analyst at J.P. Morgan Securities Ltd. in London, said. The “deep discount for palm” reflects tightening supplies of soybean oil and more palm oil, and “those drivers will shortly go into reverse,” he said. Seasonally, palm oil production has peaked while soybean oil supplies are just coming onto the market, and these factors will reduce soybean oil’s premium, Gorey added. Soybean oil dropped for the first time in five days, easing 0.6 percent to 40 cents a pound at 4:01 p.m., after advancing 6 percent in the previous four days. The premium narrowed to $182.75 after palm oil’s gain today. Malaysia, the second largest producer of palm oil, reported record output of 1.99 million tons in October, lifting reserves to 1.97 million tons, a 10-month high, the country’s palm oil board said Nov. 10. Drier weather in Southeast Asia because of El Nino may “crimp” production of palm oil in the first half and lower yields in the second half, potentially narrowing the tropical oil’s discount to soybean oil, the JPMorgan report said. In China, the largest consumer of edible oils, May-delivery palm oil on the Dalian Commodity Exchange rose as much as 1.5 percent to 6,452 yuan ($945) a ton, and ended 0.5 percent higher at 6,392 yuan for the highest close since Aug. 28. Nov. 16 (Bloomberg) -- The Organization of Petroleum Exporting Countries is “happy” with crude oil prices between $75 and $78 a barrel, said the group’s president, Angolan Oil Minister Jose Maria Botelho de Vasconcelos. Current crude oil prices are at a “good level,” he said today at a conference in Abu Dhabi. Global oil demand may rise by 20 million barrels a day to 106 million barrels a day between 2008 and 2030, he said. Oil prices have climbed by about 74 percent this year, trading above $80 last week, on speculation the pace of the global economic recovery is accelerating. The rebound in prices, which had dropped as low as $32.40 a barrel in December, came after OPEC members agreed to cut production late last year. The oil “price is not too high,” Botelho de Vasconcelos said. “I think that the economy can recover at this price.” Even $80 a barrel “is not too high,” he said. Oil today rose from a one-month low. Crude oil for December delivery advanced as much as $1.21, or 1.6 percent, to $77.56 a barrel in electronic trading on the New York Mercantile Exchange. The contract traded at $77.25 at 11:18 a.m. in London. OPEC, supplier of about 40 percent of the world’s oil, sees “uncertainty” in the oil market, Botelho de Vasconcelos, said. Sustained investment in exploration and production can help avoid future price volatility, he said. The group’s average compliance with its goal of cutting output is about 65 percent, he said, adding that “this level is good for us.” Compliance with agreed cuts slipped to about 60 percent in October, from 62 percent in September, according to data from OPEC’s own monthly report, published Nov. 11. Oil inventories are equal to about 62 days worth of oil use, the OPEC President said. The so-called forward cover “should ideally be about 52 or 53 days,” which would help balance the market, he said. OPEC’s 12 members are Algeria, Angola, Ecuador, Iran, Iraq, Kuwait, Libya, Nigeria, Qatar, Saudi Arabia, the United Arab Emirates and Venezuela. The 11 members bound by supply quotas pumped 26.523 million barrels a day last month, compared with a formal limit of 24.845 million per day, according to OPEC’s latest monthly report, which uses data from secondary sources including analysts and news agencies. Iraq is exempt from quotas. OPEC members are scheduled to meet on Dec. 22 in Luanda to review production quotas that the group left unchanged at three gatherings in 2009. OPEC last agreed to increase supply targets in September 2007. The OPEC President declined to predict whether OPEC would change quotas at the Luanda meeting, saying only: “you must wait.” On Nov. 13, he had said OPEC members may keep current production levels when it meets next month. Qatar’s energy minister Abdullah bin Hamad al-Attiyah said in Tokyo today he doesn’t expect OPEC to decide to increase crude oil production at its next meeting in December. Asked whether oil should continue to be priced internationally in U.S. dollars, Botelho de Vasconcelos replied that that issue requires further reflection within OPEC. Nov. 17 (Bloomberg) -- Crude oil traded near $79 a barrel in New York after rising on optimism fuel demand will increase amid improved prospects for an economic recovery in the U.S., the world’s biggest energy consumer. Oil gained 3.3 percent yesterday as stocks climbed after U.S. retail sales increased more than forecast and Asian government leaders pledged to maintain economic stimulus spending. Crude also gained as the dollar weakened, increasing the appeal of commodities as an alternative investment. Crude oil for December delivery traded at $78.85 a barrel, down 5 cents, in electronic trading on the New York Mercantile Exchange at 10:15 a.m. Sydney time. Yesterday, the contract rose $2.55 to settle at $78.90, the biggest gain since Sept. 30. Futures are up 77 percent this year. The Standard & Poor’s 500 Index gained 1.5 percent to 1,109.3 yesterday in New York and the Dow Jones Industrial Average added 1.3 percent to 10,406.96. Both reached the highest levels since Oct. 2, 2008. The 21-member Asia-Pacific Economic Cooperation group, which represents 54 percent of the global economy, said in Singapore that it will maintain stimulus measures until there is “durable” growth. The Organization of Petroleum Exporting Countries won’t increase its output quotas when it meets in December, Qatar’s energy minister, Abdullah bin Hamad al-Attiyah, told Bloomberg News in Tokyo yesterday. OPEC will meet on Dec. 22 in Luanda, Angola, to discuss output targets after agreeing to leave them unchanged at the past three meetings. The group’s compliance with the production cuts slipped to 60 percent in October from 62 percent in September, it said in a report on Nov. 11. October retail sales in the U.S. rose 1.4 percent, Commerce Department figures showed yesterday in Washington. Sales were projected to climb 0.9 percent, according to the median estimate of 66 economists in a Bloomberg News survey. The gross domestic product of Japan, the third-biggest oil consumer, grew at a 4.8 percent pace in the third quarter. Japan’s growth rate was higher than the forecasts of all 20 economists in a Bloomberg News survey, Cabinet Office figures showed yesterday in Tokyo. It was the second straight advance after the nation’s deepest postwar recession. The dollar was at $1.4969 per euro at 10:10 a.m. in Sydney from $1.4970 yesterday. Brent crude oil for January settlement climbed $2.45, or 3.2 percent, to end the session at $78.76 a barrel on the London-based ICE Futures Europe exchange yesterday. Nov. 17 (Bloomberg) -- The dollar fell a third day against the euro on speculation Federal Reserve officials will today reiterate the central bank’s pledge to keep interest rates near zero to support economic growth. The yen was poised to drop against its major counterparts before a report today forecast to show U.S. industrial output advanced in October for a fourth month, damping demand for Japan’s currency as a refuge. The euro climbed against the yen as Asian stocks extended a global rally, boosting demand for higher-yielding assets. The dollar fell to $1.4994 per euro at 9:06 a.m. in Tokyo from $1.4970 yesterday in New York. The euro rose to 133.53 yen from 133.33 yen. The dollar fetched 89.03 yen from 89.05 yen. Yesterday it touched 88.76, the lowest level since Oct. 9. The Dollar Index, which IntercontinentalExchange Inc. uses to track the greenback’s value against the euro, yen, pound, Canadian dollar, Swiss franc and Swedish krona, fell 0.6 percent to 74.894 in New York yesterday. It touched 74.679, the lowest level since August 2008. Federal Reserve Chairman Ben S. Bernanke said yesterday in a New York speech that the Fed “will help ensure that the dollar is strong and a source of global financial stability.” Economic “headwinds” of weak lending and labor markets will probably restrain the pace of the U.S. economic recovery, warranting a continuation of low borrowing costs. “The dollar will remain under selling pressure after Bernanke stated that the market has got it wrong when it comes to the timing of the implementation of the Fed’s exit strategy, implicitly suggesting that the Fed still sees substantial risks to the economic rebound,” analysts led by Hans-Guenter Redeker, London-based global head of currency strategy at BNP Paribas SA, wrote in a research note yesterday. Richmond Fed President Jeffrey Lacker will speak on the economic outlook to the annual retreat meeting of the state’s House Appropriations Committee in Richmond, Virginia today. Cleveland Fed President Sandra Pianalto is set to speak at the 11th Annual Ohio Housing Conference in Columbus, Ohio today. The yen was set to fall as economists surveyed by Bloomberg News forecast factory output in the U.S. probably rose 0.4 percent in October after gaining 0.7 percent in September. The Federal Reserve’s report is due today. The Nikkei 225 Stock Average rose 0.4 percent, and the MSCI Asia Pacific Index of regional shares advanced 0.3 percent. The Standard & Poor’s 500 Index rose 1.5 percent in New York yesterday. CPO 3rd month Feb futures contract traded RM48 points higher as compare to previous trading sessions to close at RM2336 with a total of 9,604 lots traded in the market. CPO price was traded higher as soybean oil and crude oil electronic trading were traded firm during trading sessions due to favorable export figure release during morning and afternoon sessions. Technically, CPO price manage to break up daily resistance levels at RM2275 levels while complete minor wave 3 counts at RM2360 at 238.1% Fibonacci resistance levels. Based on our technical view, CPO price seems possible to retrace slightly despite manage to break above resistance trend line provided resistance levels at RM2360 and RM2373 regions. Traders were advice to hold long on dip in the coming trading session around support levels at RM2283 and RM2310 regions. FKLI Nov Futures contract traded 9 points higher to close at 1282 levels as compare to previous trading session to with a total of 3,784 lots traded in the market. FKLI was opened and traded higher due Dow Jones overnight and electronic trading were traded encouraging while regions indices were traded firm during trading sessions and directly enhance investor’s confident to hold long position. Technically, FKLI price was traded within a uptrend parallel channel and manage to complete 178.6% Fibonacci resistance levels at 1284 regions during trading sessions. Based on our technical view, FKLI is possible to retrace slightly in the coming trading session towards support levels at 1274.5 and 1264.5 regions. 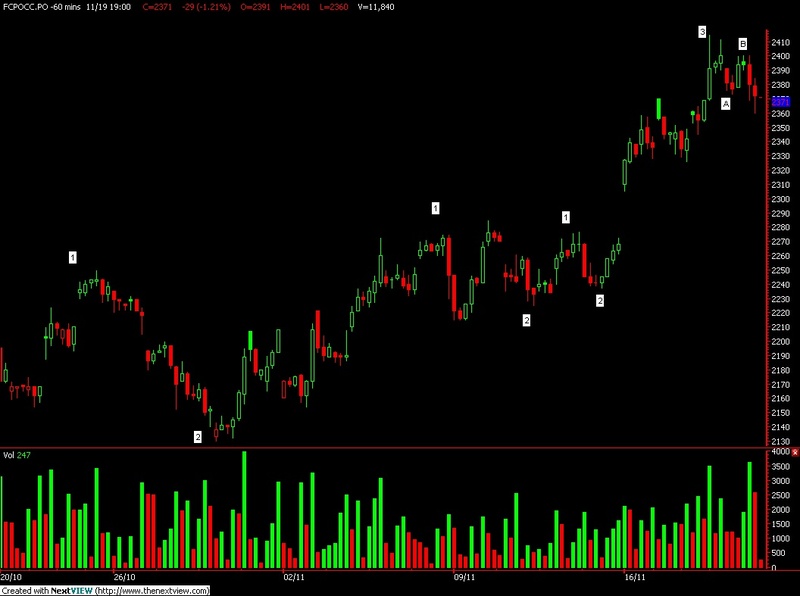 Our opinion suggests FKLI still riding on a affirmative bull rally provided support levels were not violated during trading sessions. Traders were advice to apply long on dip strategy in the coming trading sessions while be cautious around resistance levels at 1285 and 1300 levels.